This wonderful large box was created by Tsvetkov from Fedoskino. The composition depicts the St. Trinity Sergious Monastery located in the town of Sergiev Posad , one of the most interesting towns in Russia. The town was built in the 14th century as a settlement around the St. Trinity Monastery established by reverend Saint Sergious Radonezhsky. He was canonized by the Russian Orthodox Church and became one of the most honored Russian Saints. The St. Trinity Sergious Monastery was one of the largest monasteries founded in Russia in the 14th-15th centuries. In 1774 it was elevated to the status of Lavra (the Greek word "laura" means monastery), i.e. the monastery of the highest rank. The Sergious Lavra played an important role in the history of the formation of the centralized Russian State and in the development of the Russian culture. Due to its wealth, the monastery could afford to invite the best architects and icon painters for the construction and decoration of the buildings. Icon painters Andrey Rublev and Daniel Chorny worked there, they decorated with frescoes the main church of the monastery - the Trinity Cathedral. The cathedral keeps the imperishable relics of Reverend Sergious. For many centuries his tomb has been the place of pilgrimage for orthodox believers. It is impossible to overestimate the importance of the monastery and its founder for the history of Russia. It is the basis that supports Russian spirituality, statehood, and national character. The Trinity-St. Sergius Laura grounds include the biggest Russian monastery, the monastery necropolis and the Moscow Ecclesiastical Academy and Seminary. There remains a historical and architectural XV-XIX century ensemble of churches, belfries and chambers. Looking at the composition attentively we can make a tour of the St. Trinity Sergious Monastery. 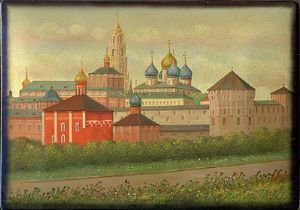 In the foreground, outside the white-stone wall we can see two small churches: the Pyatnitskaya Church and the Chapel of Pyatnitsky well (1547). Behind the wall of the monastery we can see the domes of the Assumption cathedral (four blue domes encircling a big golden dome) that was built in 1554 by the will of Ivan the Terrible in memory of Kazan's conquest. To the left of the Assumption cathedral there is the Tsars' palace, built in the 17 century; and, at last, a little above the Tsars' palace we can see the Belfry, built in 1769. The artist uses a palette of paints that accurately showcases the cathedral as well as creates a setting for summer. Metallic gold powder is used in the depiction of sky. The usage of gold powder helps to reproduce the sunset and beautifully vivifies composition. The architecture is expertly executed. Its lines and perspectives hold a dignified precision that is a result of the excellent execution. The box is made out of paper-mache. Black lacquer covers the exterior and red lacquer covers the interior of the box. The box has a hinge above the composition and rests on a flat bottom. It is signed with the name of the artist, village, and year (1982).